Summerly at The Hoxton, Williamsburg. Photo courtesy of The Hoxton. 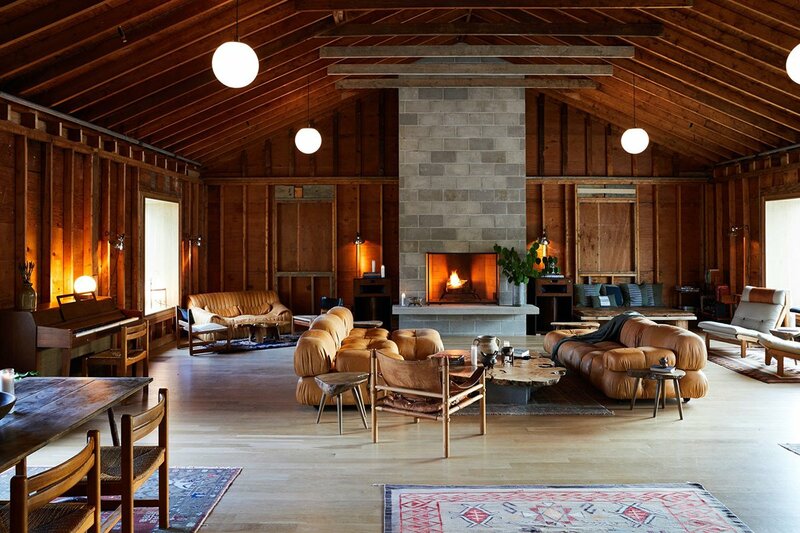 Keeping tabs on new hotels for our quarterly roundups is a favorite pastime at Fathom HQ. Summer and fall revealed so many great new properties that it was hard to choose just fifteen outstanding openings. A chic country estate outside London has us dreaming of cozy days in front of a fireplace with hot toddies. The boutique hotel trend finally reaches Las Vegas. One of our favorite indie hospitality companies opens the first of several stunning safari lodges in Namibia, a country that is very high on our bucket list. Yours, too? Dig in and start dreaming about your next vacation. Email the Fathom Travel Concierge and we'll book the perfect hotel stay for you. Why we’re excited: An all-star team — including key players from the band Wilco, Brooklyn Magazine, and MASS MoCA — is behind this reimagined motor lodge, so it should come as no surprise that the stylish 48-room riverside retreat is already a hit with the Instagram set. Guest rooms feature high-vaulted ceilings, king-size beds, and picture windows with built-in lounge seats; Julie Pearson (Spartan Shop) is behind the pared down decor. Surrounding the hotel, stunning views of the nearby woodlands, forest, river, and mountains abound. A 220-foot suspension footbridge connects the hotel with a 30-acre network of trails, glens, and forest clearings that will one day be used for open-air concerts and private events. Loom, a restaurant led by chef Courtney Burns (formerly of San Francisco’s Bar Tartine) is slated to open in early 2019. Photo courtesy of the The Hoxton, Williamsburg. Why we’re excited: The first U.S. outpost from the hip British mini-chain is a pleasure to spend time at (so much so that our team has taken to occasionally working from the bright and airy lobby). Located in a former water tower factory in Williamsburg, the stylish hotel has 175 rooms (guests can choose from views of Brooklyn or the iconic Manhattan skyline) with brass accents and bespoke linens, three restaurants and six bars (including Summerly, an open-air bar and restaurant bringing East Coast summer vibes to New York City), and a full calendar of cultural and lifestyle events. Several Brooklyn makers (Brins Jam, Brooklyn Candle Studio, Sesame Letterpress) have been tapped to create one-of-a-kind products for guests to browse and purchase in the lobby. Why we’re excited: We’re swooning over the elegant interiors of this quintessential Georgian manor an hour-and-a-half outside London. 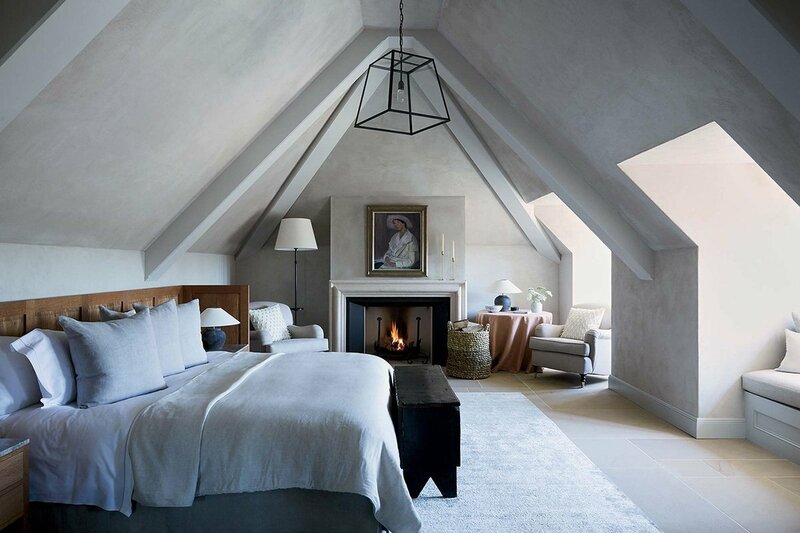 With bones dating back to the 1800s, interior designer Ben Thompson (formerly of Studioilse) transformed the historic family estate into a sophisticated and peaceful country retreat with 45 guest rooms set on 400-acres of rolling farmland. A biodynamic farm, walled gardens and orchards, two restaurants lead by culinary director Skye Gyngell (formerly of Petersham Nurseries and currently of Spring), an extensive wine cellar and tasting room, and a spa offering all-natural treatments from the Wildsmith Skin range round out the offerings at one of this year’s most anticipated openings. Photo courtesy of Hotel Peter & Paul. Why we’re excited: Just when we thought the New Orleans boutique hotel boom might be slowing down, we received word of this gem, a joint project between ASH NYC and Nola resident Nathalie Jordi, opening in the Marigny neighborhood. 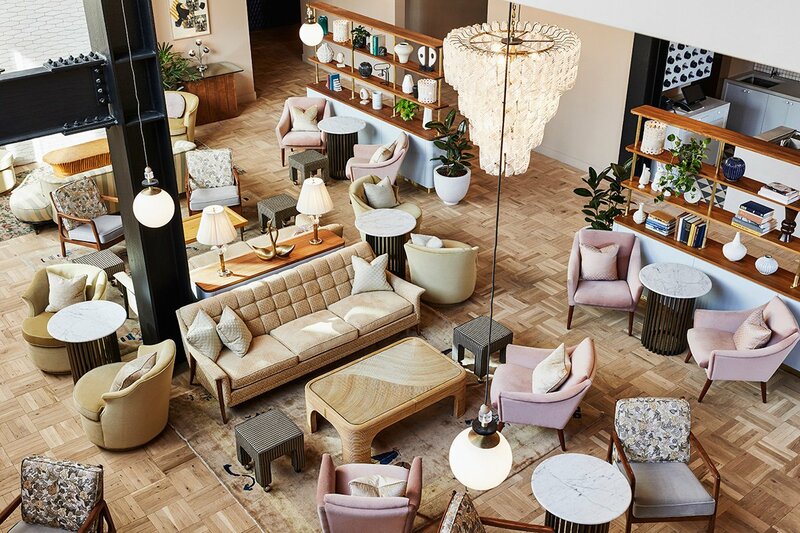 Set in a historic 19th-century compound that once consisted of a church, rectory, schoolhouse, and convent, the 71-room hotel has a refreshing grown-up vibe that feels different from the city’s other newcomers. 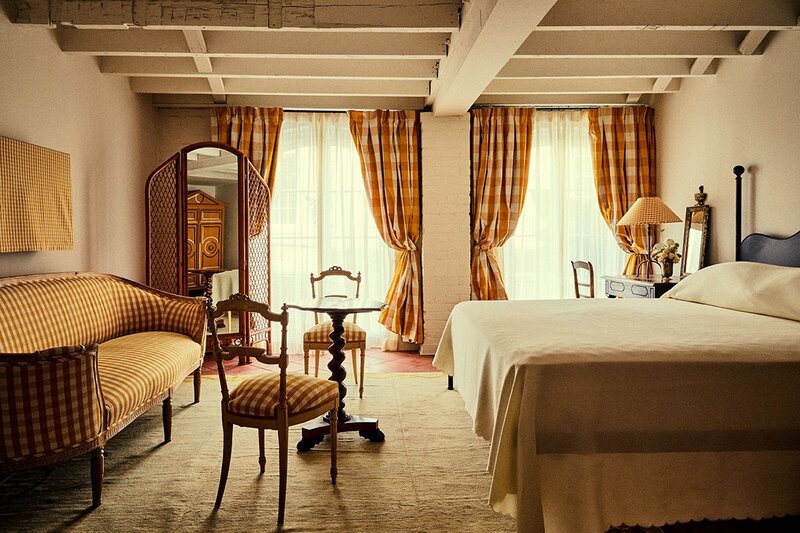 Rooms are decorated with gingham fabric in rich hues of red, blue, green, and yellow (a palette of colors derived from 14th-18th century religious paintings); baroque-style wood furnishings; and simple white linens. 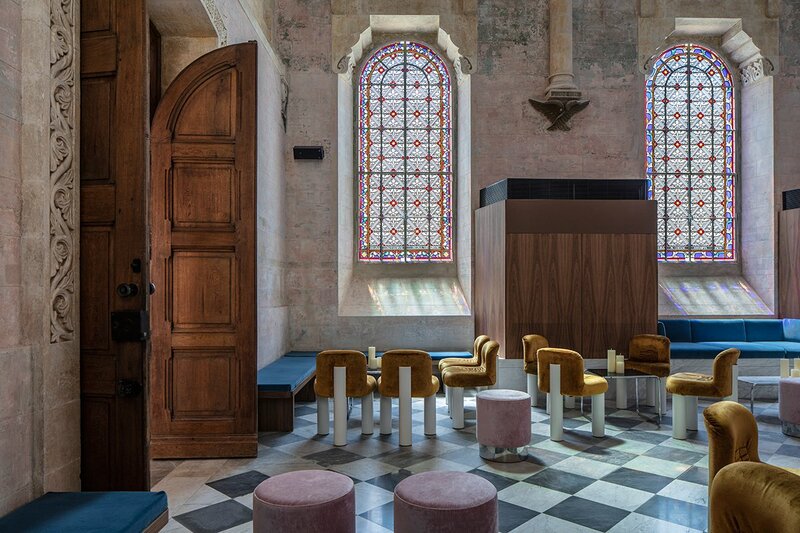 The decommissioned red-brick Catholic church, designed by renowned New Orleans architect Henry Howard, will be used for events and gatherings. Details about the restaurant and bar are forthcoming, but we’re told the team behind local favorite Bacchanal will be opening a space in the old rectory. Why we’re excited: We’ve mentioned it before and we’ll say it again – Zannier Hotels is one of the young hospitality brands we’re most excited about. With four lodges set to open in Namibia by 2020, the Belgium-based firm has a simple and timeless design ethos that they’ve successfully translated across vastly different destinations, including Siem Reap, Cambodia, and Ghent, Belgium. 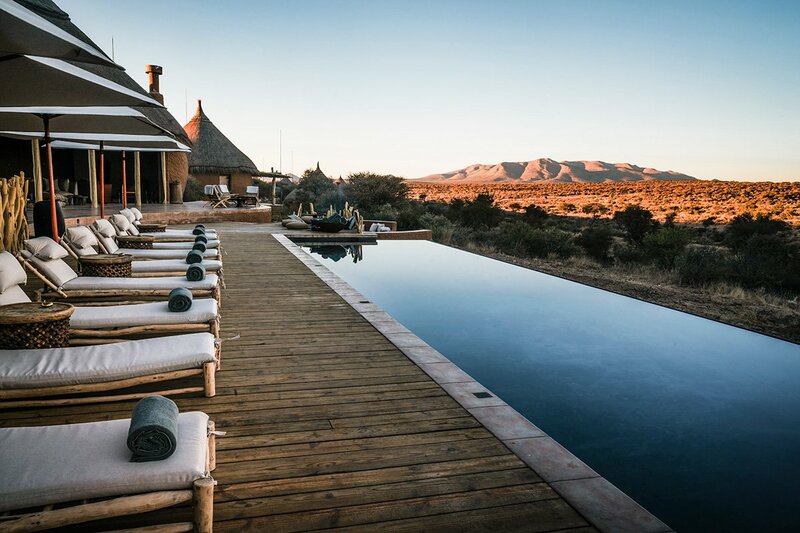 The newest opening, a ten-hut lodge inspired by traditional Owambo architecture with a heated swimming pool, two spa rooms, a restaurant, and two bars, is set in the heart of a private animal reserve and has us daydreaming about a visit to Southwest Africa. Fun fact: Founder Arnaud Zannier was inspired to set up shop in Namibia after a conversation with actress Angelina Jolie, who spent several months living at his hotel in Cambodia. Photo courtesy of The Jaffa. 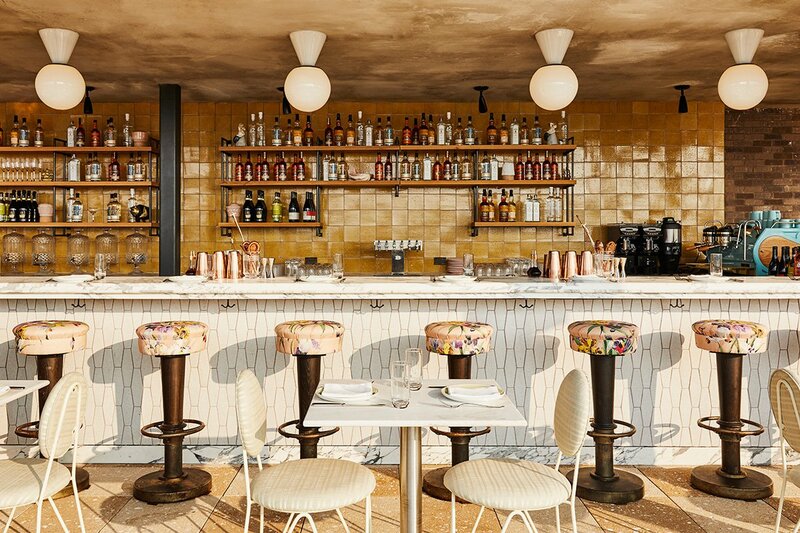 Why we’re excited: New York City real estate mogul and hotelier Abby Rosen (Gramercy Park Hotel, 11 Howard) is bringing his hospitality know-how to the 4,000-year-old port neighborhood Jaffa. 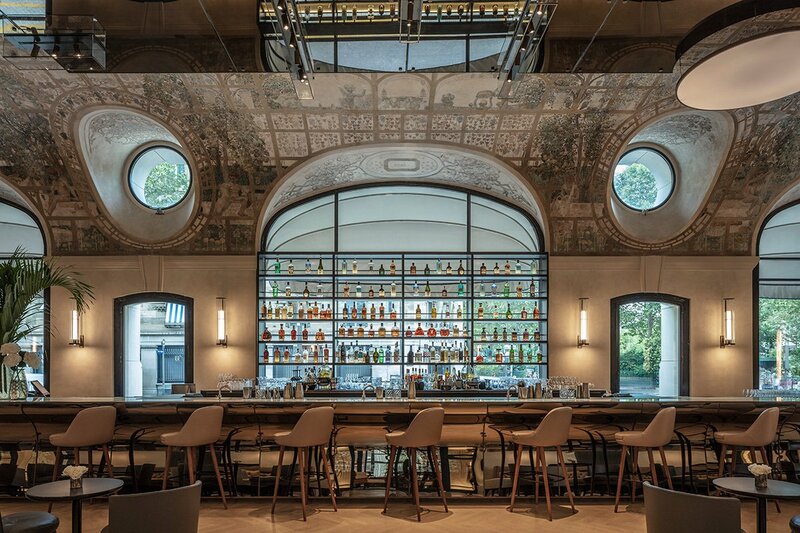 A labor of love that has been in the works for several years, the restored 19th-century French hospital has 120 hotel rooms and 32 residences with vaulted ceilings, contemporary furnishings in neutral tones, and crisp white linens. Restaurant offerings range from a Jewish delicatessen serving traditional dishes like homemade bagels and lox, to a New York-style Italian joint (a collaboration between Israeli chef Roi Antebi and Major Food Group). An outdoor pool, fitness center, and wellness spa are also on site. Photo courtesy of Caldera House. 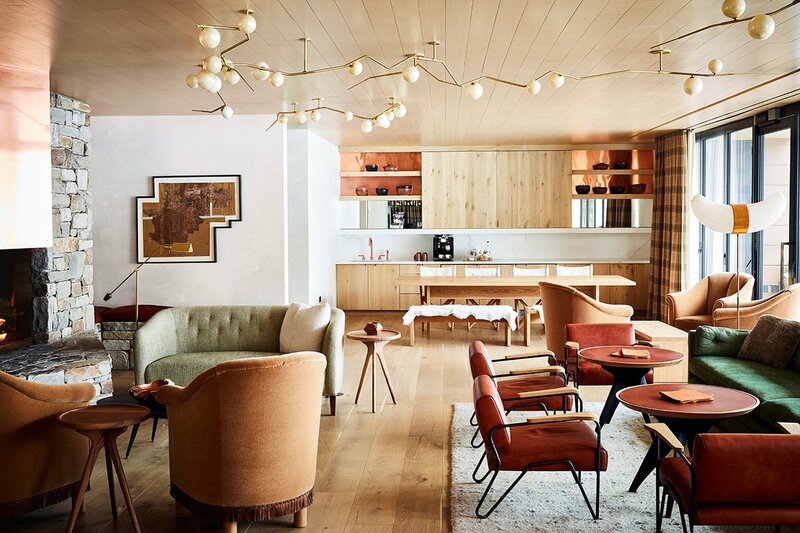 Why we’re excited: Located at the base of Jackson Hole Mountain Resort, the eight-suite hotel and members club was decorated by two award-winning design firms: L.A.-based Commune and local studio Carney Logan Burke. Mixing European style with American craftsmanship, the interiors have a modern chalet vibe that feels both cozy and sophisticated. 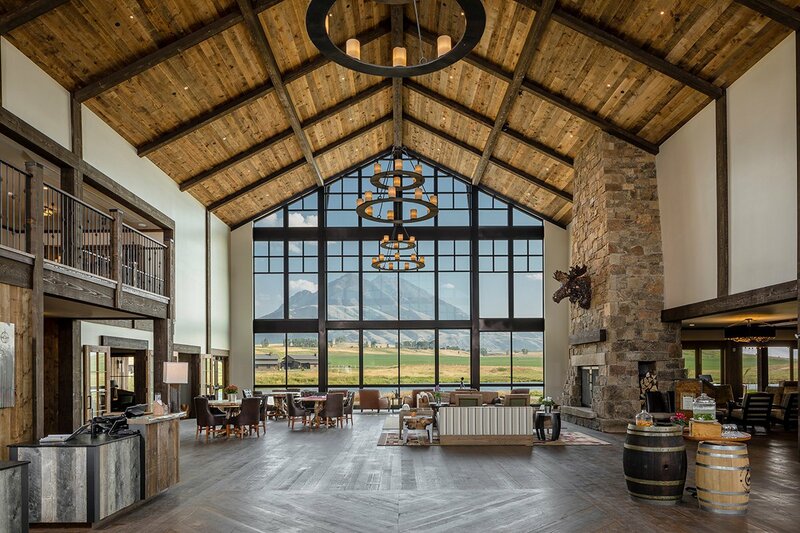 There are four four-bedroom suites and four two-bedroom suites (each with a chef’s kitchen, gas fireplaces, and private balcony), a restaurant and cafe, private bar, lounge, locker room, ski valet, and ski shop. A dedicated staff is on hand to help arrange activities, including wildlife safaris through Yellowstone National Park in the summer and heli-skiing excursions in the winter. 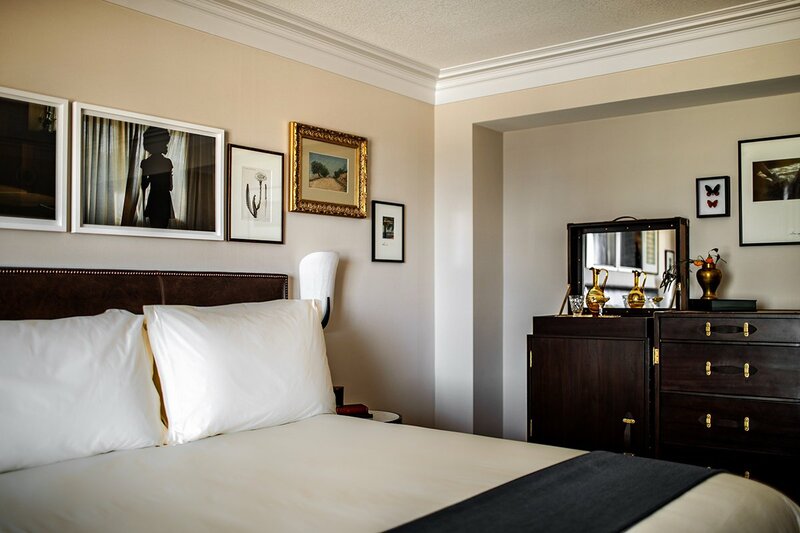 Photo courtesy of Hotel Lutetia. Why we’re excited: Originally opened in 1910 by the family who founded Le Bon Marche, the chic Left Bank hotel has undergone a four-year-long transformation. Each of 184-rooms (47 of which are suites) have been enlarged and decorated in a simple palette of blue and white with glossy wood accents. A health and wellness center with six treatment rooms, a sauna, steam room, plunge pool, infinity edge Jacuzzi, 55-foot-long swimming pool, and fitness room is also available to guests. An assortment of dining and drinking options include the stunning Bar Josephine, inspired by the legendary American-born French entertainer. Later this year, we’ll see the opening of Lutetia Brasserie, the first Parisian restaurant from Michelin-starred chef Gérald Passedat. Photo courtesy of Al See Hotel by Jumeirah. Why we’re excited: In a city known for its flashy and ostentatious decor, the understated interiors of this 200-room hotel, which are spread across 22 traditionally designed Arabian bayt homes, are a pleasant surprise. 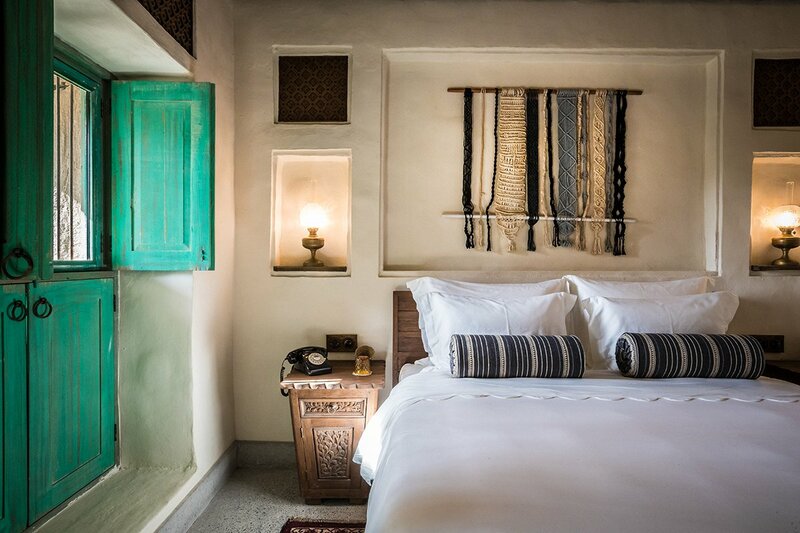 Rough plastered walls, wooden ceiling beams, and pale wood furniture set a low-key tone, while lux white linens and local touches (antique light switches, Middle Eastern woven fabrics) give the feeling of laid-back luxury. The restaurant, Saba’a, dishes up local cuisines in an equally charming space. Photo courtesy of Zuri Zanzibar. Why we’re excited: With nearly 1,000 feet of private white sandy beach, the idyllic retreat is a welcome addition to the archipelago's main island, Unguja. 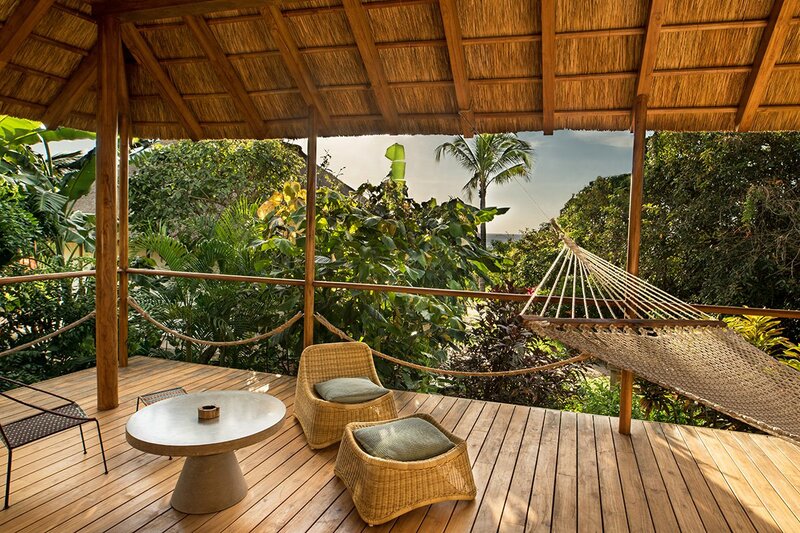 Fifty-five rustic-chic bungalows, suites, and villas are set among the hotel’s lush landscaped gardens. A three-bedroom private village comes with a lounge, kitchen, private swimming pool, game room, and ocean views. The hotel aims to be as self-sufficient as possible by using water from its own wells and investing in water recycling and a sustainable space-cooling system. Three restaurants, four bars, an infinity pool, and a yoga and wellness center are available to guests. For those looking to explore their surroundings further, the hotel can organize scuba diving, kit surfing, and jungle excursions. Why we’re excited: Over the last year, China’s largest city and financial hub has seen an abundance of high-profile openings. 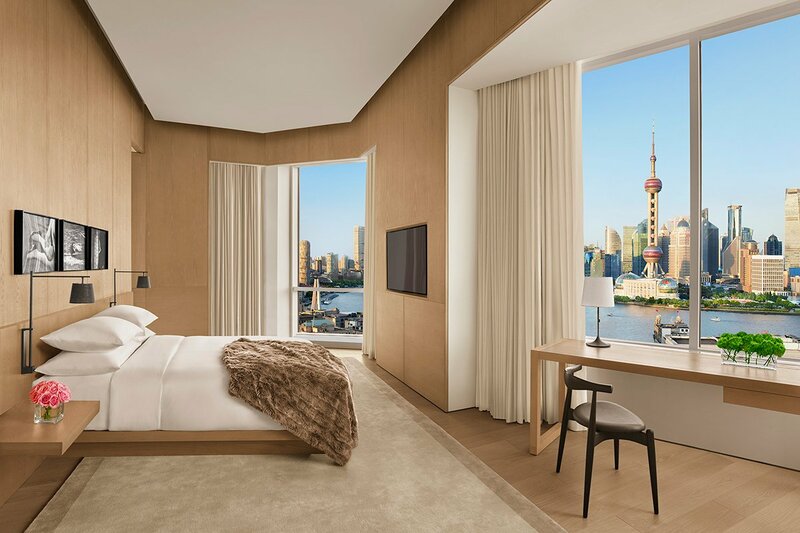 The most recent is a sleek and minimalist hideaway in one of the city’s finest art deco buildings (and the former headquarters of Shanghai Power Company). A new skyscraper houses the 145 guest rooms, which come with state-of-the-art beds dressed in luxe Anichini linens, custom-designed furniture, white marble bathrooms, and Le Labo toiletries. Among the many dining and drinking options are Hiya, a glamorous izakaya-style restaurant, and an outpost of The London Edition’s award-winning Punch Room, a modern-day reincarnation of a 19th-century private club. 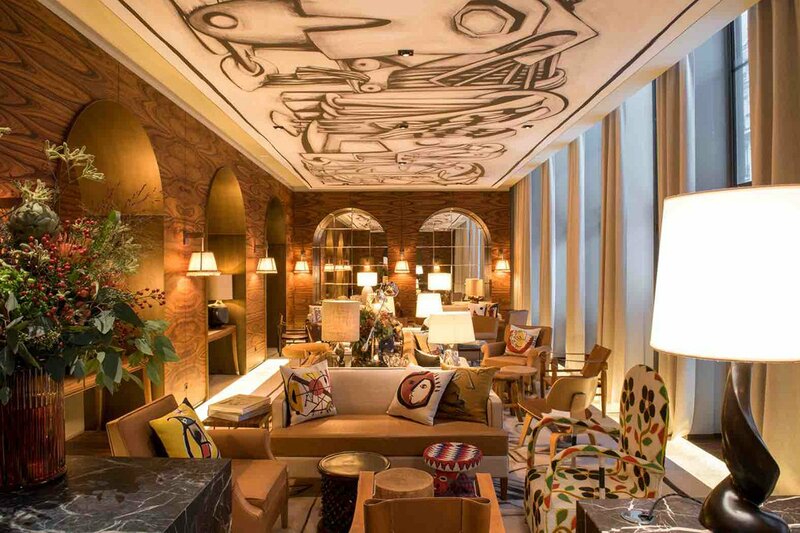 Photo courtesy of The NoMad Hotel. Why we’re excited: The coolest hotel in Las Vegas? We think so. The top four floors of Park MGM have been transformed into a elegant 293-room boutique hotel. French interior decorator Jacques Garcia is behind the glamorous, European-inspired interiors, which have a residential feel with oak hardwood floors, original artwork, Bellino linens, and minibars built into steamer trunks. Many feature the iconic NoMad freestanding-pedestal bathtubs and leather headboards. Join a game of roulette or blackjack at the first-ever NoMad Casino under the building’s historic Tiffany glass ceiling or dine at one of the hotel’s two restaurants, both run by award-winning chef Daniel Humm and restaurateur Will Guidara of Eleven Madison Park. Photo courtesy of Hotel Brach. Why we’re excited: Located in the hip 16th arrondissement, the playful and spacious Philippe Starck-designed hotel has 59 guest rooms decorated in 1930s-style furniture, warm colors, and natural and raw materials (wood, leather, concrete, marble). Instead of the usual minibar, each room comes with a micro concept shop offering a curated selection of books. Restaurant Brach dishes up Mediterranean-style fare, while traditional French desserts are served at Brach Patisserie. The ginormous sports club is not to be missed, with its 72-foot swimming pool, sauna, hammam, salt cave, and boutique fitness class offerings (Pilates, boxing, yoga). For those staying in suites, an exquisite rooftop vegetable garden with hens is an idyllic spot to take in views of the Eiffel Tower while enjoying a cocktail. Photo courtesy of Generator Hotels. Why we’re excited: For laid-back vibes with retro-Miami flair, look no further than the first U.S. outpost of Europe’s design-driven Generator brand. With rates starting at $20 for a shared room or $95 for a private room and a prime location on legendary Collins Avenue, the affordable 105-room hostel-hotel is destined to be one of the city’s most booked addresses. 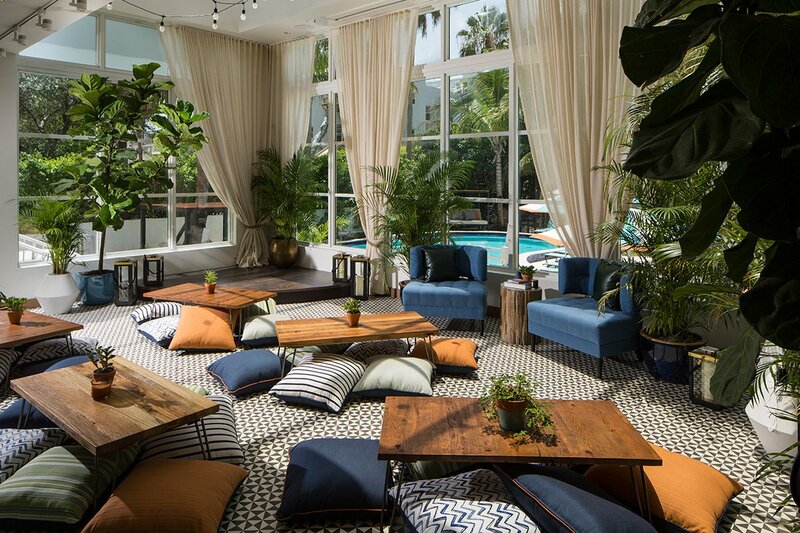 At the hotel's center is a kidney bean-shaped swimming pool with a mural painted by South African artist Chris Auret and a poolside bar run by mixologist Gui Jaroschy (formerly of Broken Shaker). Photo courtesy of Sage Lodge. Why we’re excited: Located on the picturesque banks of the Yellowstone River, less than 35-minutes from Yellowstone National Park, the rustic 50-room lodge is an idyllic home base for exploring the stunning surroundings. With a variety of outdoor activities, including hiking and biking trails, fly-fishing, llama trekking, and over a mile of Yellowstone River access, nature is at your front door. For larger groups, there are four cabins with full kitchens, a dining area, living room, and private patio that can accommodate up to sixteen guests each. Also onsite: two restaurants, a fitness center, and a spa.